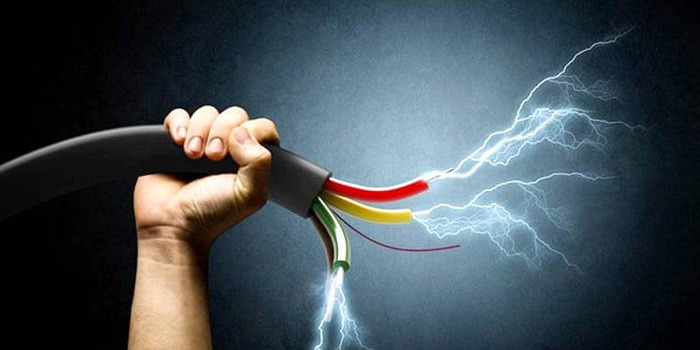 Electrocution is when an electric current passes through the body which experiences an electric shock. Electrocution can cause death or severe injuries depending on how strong the current is. Low level currents can be introduced to the body and only cause numbness but high levels can severely harm someone as they enter the body. Low level currents can affect the beating of a human heart which can causes the heart to skip a beat in an unnatural manner. High level shocks pass through body fast and stop the heart from beating. Low level electrocution often leaves no external visual indicators whereas high level electrocution causes a burning of hair and skin and leaves visible scarring on the body. A the person will often have charring or burn marks around the point where the electricity first made contact with the body. As well, skin can blister and become red. Burns from electric shock are treated according to their severity. Minor burns may be treated with topical antibiotic ointment or dressings. More severe burns may require surgery to clean the wounds or even skin grafting. Severe burns on the arms, legs, or hands may require surgery to remove damaged muscle or amputation. Eye injuries may require examination or treatment from an eye specialist. Broken bones require surgery to stabilize the bones or casting and splinting. To be eligible for this tax credit, a person must be restricted in at least one of the following categories: speaking, hearing, walking, elimination (bowl or bladder functions), feeding, dressing, performing the mental functions of everyday life and life-sustaining therapy to support vital function. How To Apply for Disability Tax Credit for Electrocution?